For the last few weeks now Maxwell and I have been planning something exciting. Not only do I hope that it shall help with Maxwell's speech but I also hope that a lot of our readers will engage and enjoy our new projects. 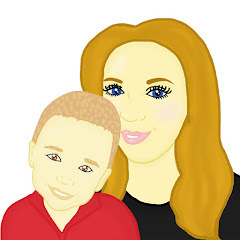 We are working on 2 projects in particular, one that you will see on Monday and 1 in the near future when Mummy has more time to start creating. Maxwell has been on lots of trips this week but by far his favourite trip this week was in the forest. Maxwell loves going outside and he adores playing and running in the outdoors. 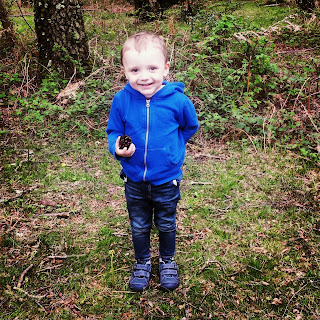 This week we allowed Maxwell to choose a enclosure in the New Forest to visit. Although the one we visited did not have a long trail to walk through, we enjoyed visiting and we hope to visit it again. We found that it was set deep into the New Forest and because of this we managed to find lots of animals such as deer, horses and lots of birds. It was fairly quiet to walk through and this summer we are looking forward to going on more walks as a family. Maxwell loved going back to preschool this week and it was clear to see that he had missed a few of his close friends whilst he had been on holiday. This week Maxwell brought us home drawings which was lovely to see as he had not done this often before. Maxwell and I are loving the warm walks back and forth to preschool, we love the fact we are getting very little rain. We can not wait for the summer to come around. Maxwell is set to have a busy week this week. Not only does Maxwell have to attend preschool this week, he has his last meeting with his speech therapist before she leaves, Maxwell also has meetings with a new health visitor and Maxwell is especially keen to visit his Great Grandad for some biscuits, Auntie Rachel for a sleep over and a play date and his Great Nanny for lunch this week. Maxwell's love for Happyland has continued to grow and this week has seen us purchase him some more bits to add to his collect. Maxwell got rather lucky this week as I saw a bundle which was being sold locally very cheap, we jumped in the car to get it and Maxwell is thrilled with all the bits and bobs that came in the bundle. Maxwell paid just £20 out of his money for the bundle and since he has had it, he has not stopped playing with it. Maxwell's Happyland collection is so large, we have very little room left for anything else.